The Gerber exclusive to Platatac, designed to create a custom fit for a wide array of product combinations, the CustomFit Dual Sheath holds two items plus a pen. The patent-pending, richly featured sheath includes a quick access back panel that allows the user to customize it to perfectly fit the tools selected for the tasks of the day. Quiet Deploy™ technology is activated by simply pulling down the front tab for stealth-like access – they’ll never hear you coming. The Gerber Quad Sheath exclusive to Platatac, designed to create a custom fit for a wide array of product combinations, the CustomFit Dual Sheath holds two items plus a pen. 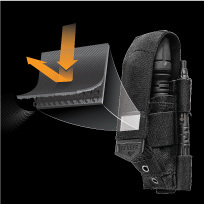 The patent-pending, richly featured sheath includes a quick access back panel that allows the user to customize it to perfectly fit the tools selected for the tasks of the day. Quiet Deploy™ technology is activated by simply pulling down the front tab for stealth-like access – they’ll never hear you coming.